Jonathan Greeson was born in a small town in North Carolina in March of 1982. He was diagnosed with Spinal Muscular Atrophy when his parents noticed he was dragging his legs when trying to crawl. They put Jonathan in a wheelchair and he hasn’t stopped since! With great support from his family and friends he was able to graduate from North Carolina State University’s College of Management where he majored in Business Management with a Finance Concentration. While in college he was a awarded an internship with the Carolina Hurricanes of the NHL. 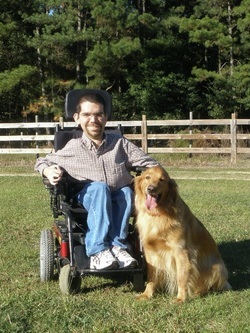 Using the knowledge gained from his internship and business courses, Jonathan founded the North Carolina Electric Wheelchair Hockey Association (NCEWHA), so that he and other disabled athletes could participate in the wonderful sport of hockey. Jonathan also works part time as a Budget Analyst when not working on the development of the Powerhockey program. More information on the NCEWHA can be found at www.ncpowerhockey.com. Look for Jonathan's book, My Online Angel, to be available from Milverstead Publishing later this year.